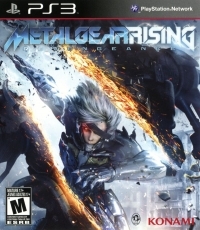 METAL GEAR RISING: REVENGEANCE marks a departure from METAL GEAR SOLID’s stealth formula with the birth of a new high-speed action game featuring the cyborg ninja “Raiden”. What threats await in a world where privatized military organizations and cyborg technology have spiraled out of control? Find out in this dream collaboration between the legendary creators at Kojima Productions and PlatinumGames! 01-10-2019 silverbow Description Packaging text in English, French & Spanish. 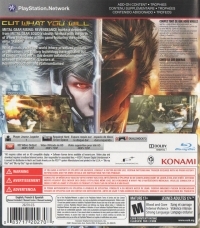 01-10-2019 silverbow Box Text CUT WHAT YOU WILL METAL GEAR RISING: REVENGEANCE marks a departure from METAL GEAR SOLID’s stealth formula with the birth of a new high-speed action game featuring the cyborg ninja “Raiden”. What threats await in a world where privatized military organizations and cyborg technology have spiraled out of control? Find out in this dream collaboration between the legendary creators at Kojima Productions and PlatinumGames! 12-11-2011 solidgear3 Description Gamers have seen the last of Solid Snake (or so the story goes...), but the Metal Gear franchise soldiers in this next installment --and this time, Raiden leads the way in "Lightning Bolt Action" gameplay. This is a list of VGCollect users who have Metal Gear Rising: Revengeance in their Collection. This is a list of VGCollect users who have Metal Gear Rising: Revengeance in their Sell List. This is a list of VGCollect users who have Metal Gear Rising: Revengeance in their Wish List.